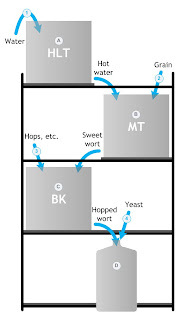 his is just a quick overview of my all-grain brewing system. I plan to add blog entries that will focus on the design and construction of its various components. What you will not find here is: “how to make beer” or “the ultimate beer-making setup”. 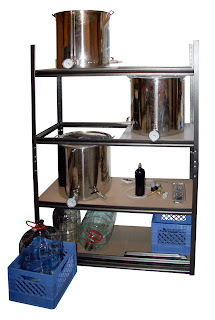 There are lots of great and diverse brewing setups – all (well, most) can make good beer. I’m just going to describe my equipment and some of the design decisions I made along the way. Most of the hyperlinks in this section will link to the HomeBrewingWiki. 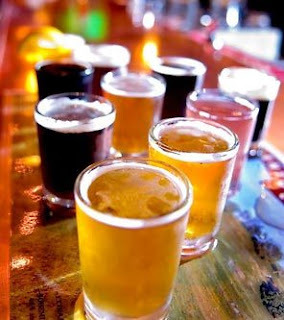 Another useful online resource is BrewWiki.com. For some background, all-grain brewing is when you make beer from scratch, i.e. start with a sack of malted grain as opposed to brewing from a can of extract or a bucket of pre-cooked wort. Well, actually “made from scratch” would require growing your own grain and germinating/drying it... but I leave that to the expert maltsters. Hot Liquor Tank (HLT) – This is where water is treated (if needed) and heated... not very exciting. Hot water is transferred from the Hot Liquor Tank to the Mash Tun. Mash Tun (MT) – This is where the milled grain is soaked (mashing and lautering) and rinsed (sparging) – this converts the grain’s stored-up starches into sugars. In my setup the mashing, lautering and sparging is done in the same vessel. The resulting liquid (called “the sweet wort”) is transferred from the Mash Tun to the Brew Kettle. Brew Kettle (BK) – Also called “the copper” (because it is traditionally made from copper), this is where the wort is boiled and hops (and sometimes other ingredients) are added. 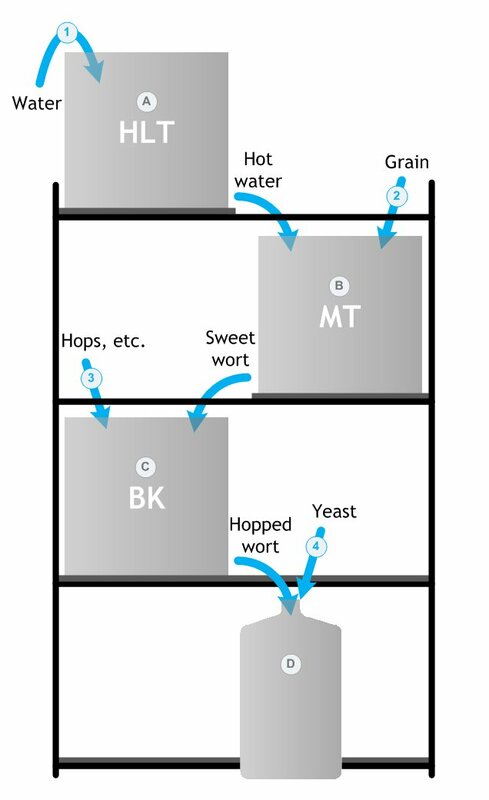 Once cooled, the resulting liquid (called “the hopped wort”) is transferred from the Brew Kettle to the Fermentor(s). Fermentor – This is where the yeast is added and the magic happens – the yeast consumes the various sugars and produces alcohol (actually ethanol, a.k.a. ethyl alcohol, grain alcohol, C2H5OH) as well as carbon dioxide (CO2) gas.